Are lead underbodies worth the effort? The mother said that she had learned to cook it like this from her mother, the child’s grandmother but they would ask granny when she came to lunch. So at lunch the mother asked Granny (her mother) , “Mom, why does one cut a gammon in half before cooking it?”, to which she replied that she had learned to do that from her mother. Now as luck, or good genes ,would have it ,the great grandmother was still extant and off to then nursing home the family trotted, it was Christmas after all, and asked of the Great Grandmother the same question. “Why does one cut a gammon in half when you cook it?”, to which the all too pragmatic response was “When I was first married we didn’t have a pot large enough to fit in a whole gammon”. That story brings up a very interesting question: how many things do we do just because we were taught to do them that way, and do they actually make any sense, or is it simply a case of doing things in a way which we always have? I would put it to you that adding lead underwire bodies to tungsten bead nymphs, something that one can watch in numerous video clips and read about in hundreds of fly tying books might be a waste of time. In fact if you don’t understand exactly what you are doing and why you are doing it, counter- productive even.. This is dangerous stuff because I recently looked at a post about a fly called “Walt’s Worm”, nothing bad about the worm, a basic hare’s ear nymph, re-branded by Walt because he had added a bead to it and ditched the tail. Nice fly, pretty in a buggy sort of way, and certainly a fish catcher I don’t doubt. Then came the instructions and “recipe”, including an under-body of lead wire and my synapses started to fire. As I said, dangerous stuff, my head can be a wondrous if confusing space and my mathematics are questionable at best, but it had me all abuzz because I question the logic, “Does bulking out the fly with lead wire make any sense?”. Out with the calculator, the computer, and references to long forgotten formulae, to ask myself the question; “What is the real difference between a Walt’s worm (or any other subsurface fly pattern for that matter), with or without the lead wire? I wound ten turns of 0.5mm lead wire around a size 10 Grip jig hook and then unwound it again to measure the length. 35 mm or close to it. How much would that amount of wire weigh? The volume of a cylinder (in this case wire) is calculated using the formula πr2L Where π is taken as 3.1416 and r is the radius of the cylinder whilst L is the length of the wire. 3.1416 x .252 x 35 = 6.87 cubic mm. The density of lead (per Wiki), is 11.3 grams (approx) per cubic cm and there are a thousand cubic mm in a cubic cm. So the mass of our piece of wire is 11.3 x (6.87/1000) = 0.0777 grams.. Wonderful so we will have added near eight hundredths of a gram to our fly by this time consuming process of laboriously wrapping lead around the hook. We will, as shall been seen later also vastly increased its diameter and therefore volume when dressed. What about Walt’s pink tungsten bead? Let’s assume that we choose to use a 3mm Tungsten Bead and here come those questionable maths again. A volume then of 14.14 cubic mm, or 0.01414 cubic centimetres. So our bead weighs 0.273 grams. Put into perspective that is 3.5 times as much as our fiddly little piece of wire. But I cheated because the bead had a hole in it, approximately 1 mm going through the middle. So actually the volume would be 14.4 cubic mm less the volume of the hole , out with the cylinder maths again. The 1 mm diameter (0.5 mm radius) hole has a volume of approximately 3.1416 x 0.52 x 3. (based on the equation πr2L again). Which equals 2.36 cubic mm or 0.00236 cubic centimeters. Why add the lead then? It does add a bit more mass to be sure but if you only used a 3.2mm Tungsten bead instead you would end up with a mass close to the total of wire and bead in the previous example, (and I am going to suggest that you forego the maths and ask that you trust me). 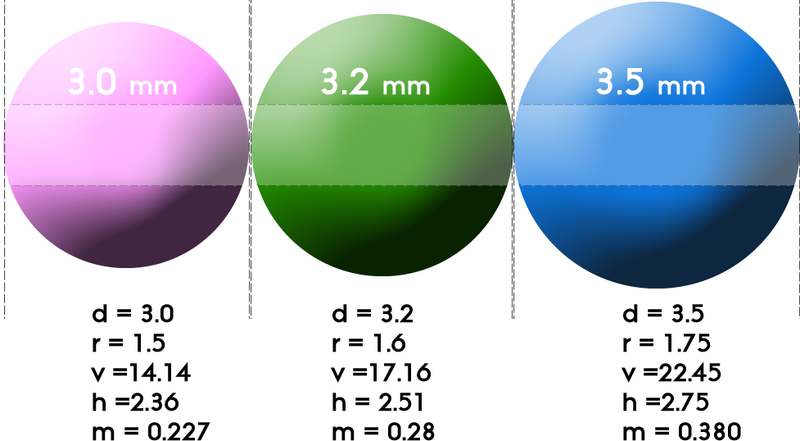 Volume of 3.2mm bead, 17.16 cubic mm less the hole (2.51 cubic mm) = 14.65 cubic mm or 0.0146 cubic centimetres and therefore a mass of 0.28 grams. In the above leaded example the total mass added was 0.227 plus 0.0777 = 0.3047 grams (0.0217 grams more but potentially a lot more bulky than the bead only version). Volume of bead = 22.45, less volume of hole ( 2.75 cubic mm = 19.7 cubic mm or 0.0197 cubic centimetres with a mass of 0.0197 x 19.3 = 0.380 grams. Remember the total added weight to our Walt’s worm with the wire and bead combined was 0.3047 grams. WOW just by adding a 3.5 mm bead instead of the 3.0 mm bead we have achieved a huge improvement in the mass and of course because of the lack of the lead underbody have a far slimmer fly which will sink faster. Not only because it has more mass but because of the greater weight and lesser volume we have far greater density too. It is worth bearing in mind that a small increase in diameter of a bead makes a massive difference in the volume and thus the mass. Now that was a very long and arduous (at least for me) means of showing that this “following the instructions” without thinking about the consequences style of fly tying puts us right up there with the people with small pots and chopped up gammon. Sure if you want a more bulky fly, it would be better to use lead wire under the body than something lighter like thread or more dubbing. But if you want to get a quantum leap in terms of mass and density using a fractionally larger bead is the business and a whole lot faster to manufacture. (Gary Glen-Young pointed out, and I agree, that if your aim is a more bulky fly then having a lead wire under-body is far better than having a thread under-body. So if profile is important then adding lead is a good idea, but if the lead is added as additional mass only , without the intention of increasing cross sectional diameter it is counter-productive because it equally increases the bulk of the dressing for little gain in mass. In other words, if you need to use something to bulk out the profile of the fly then lead wire is a good choice where sink rate is a consideration. However ,if you don’t need the bulk, then you are far better off to leave the lead out, keep the profile slim, get the mass from the bead and avoid the wasted time of winding wire. 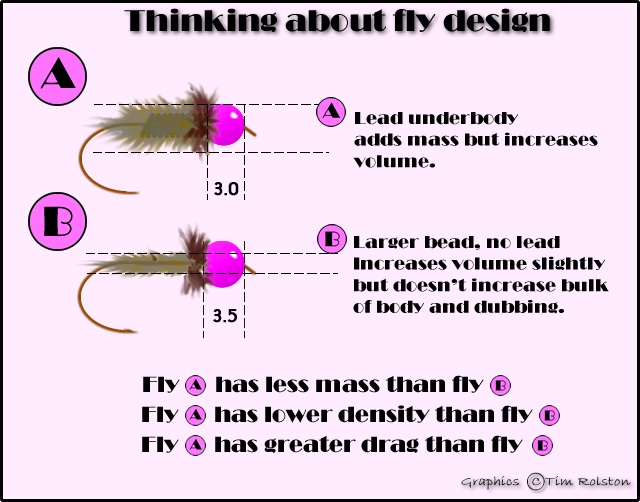 In general , these sorts of discussions amongst anglers and fly tyers are not about weight (even if they think they are), in fact they aren’t really about density either, they are about the all too practical applications of sink rate. Adding mass is great but when that also increases the volume of the dressing then it can become rapidly counter- productive. Increasing the diameter with wire, and then dubbing over that increased volume, may very well negate the benefits of more mass in terms of the sink rate of the fly. These days I add weight to flies almost exclusively with tungsten beads, sometimes tiny ones, but it is a more effective means of achieving the desired goal and adding a little bit of lead to the shank of the hook is doing little to improve the fishability of the fly. It might please you, make you feel that you are a better fly tyer and are following “the way it should be done” more accurately. But unless you are using the lead to build a profile shape, I assure you that you are wasting valuable time for no good reason. Certainly, there are other considerations when tying flies, and some nymphs you don’t want to plummet to the bottom. One might require different profiles, or movement in the water. 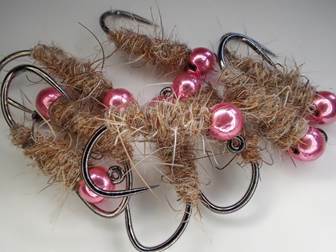 However, a tungsten bead fly on a jig hook really spells “sink fast” and if that is the point, some consideration as to how best to achieve your goal is worth it. Special thanks to Gary Glen-Young, the “go to guy” when it comes to maths and fly fishing, whose synapses fire on a far higher plane than mine and who was kind enough to check , and I have to admit on occasion “correct” my woeful mathematics. As always comments are most welcome.